HÀ NỘI — Following an overall inspection of all karaoke shops, Hà Nội has decided to suspend 126 shops and asked more than 530 others to temporarily close. The 530 shops can reopen by the end of this year if they address the violations. The information was declared this week in a meeting attended by the press and the Hà Nội Party Committee’s Commission for Publicity and Education. Deputy director of the Hà Nội Department of Fire Prevention and Control Police Nguyễn Tuấn Anh said following a fire at a karaoke shop on No 68 Trần Thái Tông Street, Cầu Giấy District, on November 1 last year, which killed 13 people, the police conducted an overall inspection of all karaoke shops. The police checked more than 1,500 karaoke shops and imposed administrative fines on 353 shops, worth VNĐ871 million (US$38,700). Common violations included lack of fire prevention and control measures because the shops were located in small alleys, limited water sources and large advertisements that hindered an emergency exit in case of a fire. Tuấn Anh also said the capital had nearly 2,700 water outlets for fire control, but 380 outlets could not be used because they were too far from water plants. The capital needed some 4,000 more water outlets for fire control, he said. 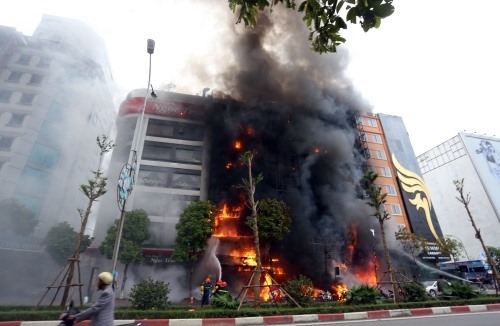 Under the present conditions, firemen’s ladders could reach only till the 16th floor, therefore fire prevention was very important, Tuấn Anh said.